NOTE: There is a Hugo rule change that may go into effect next year. We'd like to encourage you to nominate for Semiprozine as if it already happened. I'll be blogging in detail about this soon, but for now, a description of the effect of the proposal (it was modified slightly, but the effect is the same) is here. The authors of any non-fiction we published in 2011. The artists that created any of the covers we used in 2011. 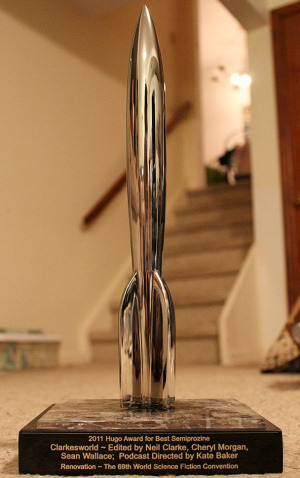 Clarkesworld Magazine won the Hugo Award for Best Semiprozine! That's Sean and Kate up there accepting the award with me. (Thanks to Stu Segal for the picture!) Sadly, Cheryl was unable to join us. Would have liked to have had the whole gang up there. As David Hartwell read off the names of the nominees, we noticed that only one Hugo had been brought out and managed to convince one another that we had lost. We were completely stunned when they announced our name. My brain promptly shut down. The whole thing is a blur, and judging by the video, I had trouble remembering how to read a pre-written speech. All I know is that my hands were still shaking when I got back to my seat. I'll have more to say later, but I just wanted to thank everyone for reading, voting, and supporting us over the years. We're incredibly honored. In celebration of Peter Watts Hugo nomination for "The Things", we’ve discounted the ebook edition of the issue it appeared in to 99 cents. The price should also be updated at Wizard’s Tower and Weightless Books shortly. 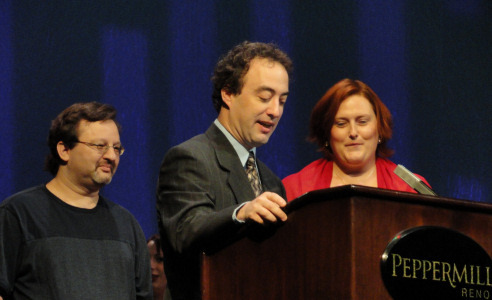 The 2011 Hugo Nominees were announced yesterday. I feel very honored that Hugo voters have nominated Clarkesworld for Best Semiprozine and "The Things" by Peter Watts for Best Short Story. You made my day. Nominations for the Hugo Awards and John W. Campbell Award for Best New Writer close today, March 26th, at 23:59 PDT. The nomination process is important and I urge anyone than can nominate to do so. It’s painless and great way for you to show some appreciation to your favorite authors, editors, artists, filmmakers, etc. You don’t have to have read or seen everything to be qualified… you just have to have an opinion about what you have seen or read. 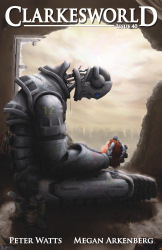 As I’ve mentioned previously, Clarkesworld is eligible in Semiprozine, I’m eligible in Editor Short form, and all of our fiction is eligible in either the short story or novelette categories (see post for category breakdowns). Naturally, I’d be thrilled to have you consider nominating our work, but whether or not you’d pick our work, thank you for nominating. As a previous nominee and winner, I can tell you that it means a lot. The Campbell Award for Best New Writer is a favorite of mine, but it never seems to receive as many nominations as it should. The most common excuse I’ve heard is that people have difficulty knowing who’s eligible. Writertopia has a convenient list that can help you work past that. There are a lot of very talented authors listed there and you should be able to find more than a few to throw your support behind. Please consider nominating Sheila Williams from Asimov’s in the Best Editor Short Form category. A win for her is long overdue in this category and she should be on the final ballot. I would shocked if she didn’t receive a nomination, but we should never take things for granted. Thanks! I look forward to seeing what everyone picks this year.